Love Me by Rachel Shukert. A Starstruck Novel. Review: Amanda Farraday is broken! She just broke up with the famous writer, Harry Gordon. Amanda tries her best to convince Harry to take her back. Meanwhile, Margo Sterling has everything anyone would dream of. She is famous, she has the looks and the one and only Dane Forrest, but believe it or not, Margo's personal life just might end her career. Gabby Preston's life isn't going so well either. She's not so healthy with alcohol and pills, and her relationship with bad-boy Eddie Sharp is just starting to take off. The book Love Me by Rachel Shukert is the sequel to Starstruck. In Love Me, each character's problems get even worse than they were originally. Amanda continues to try to convince Harry to take her back, but he isn't interested. Margo has some problems with Dane that she has to work out. Gabby cannot control her drinking, and it's not so easy when you're dating a bad boy like Eddie Sharp. The lives of each character are organized in separate chapters, one chapter it might be about Amanda, the next it might be focused on Margo. Readers will not be able to stop reading due to the outstanding writing of Rachel Shukert. I encourage everyone to read this book because the climax and other elements of the story keep you attached to the book. I think girls would like this book because they might be able to relate to the storyline more than boys. I really liked this book because each girl approaches her problems differently. This book had a very satisfying ending and I'm sure most readers would agree. The author is so descriptive with her writing; it makes you feel as if you are in the story. This is the best book I have ever read by far. I would recommend it to anyone who likes realistic fiction because overall it is a great book, and I loved it. Readers who are looking to dive into a good book just found one. Love Me by Rachel Shukert is one of the most interesting books I have ever read. Review written by Rija (6th grade student). We would like to thank Random House for providing a copy of Love Me for this review. 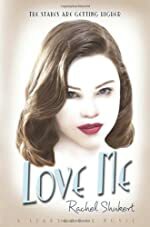 Have you read Love Me? How would you rate it?